Sen. Rand Paul, center, and his communications director Sergio Gor, right, enter a hall during their meeting with Russian lawmakers in Moscow Monday. Republican Sen. Rand Paul, in front of the American flag, attends a meeting with Russian lawmakers in Moscow, Monday. 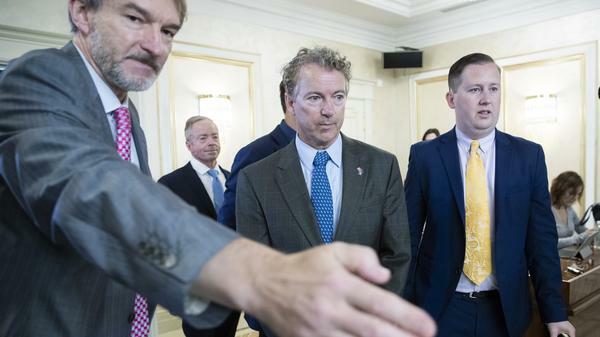 Many have also seen the visuals of Kentucky Republican Sen. Rand Paul hobnobbing in Moscow this week with members of the Russian Council, sometimes called his "counterparts." These included the chairman of the council's foreign policy panel, Konstantin Kosachev, who happens to be under official U.S. sanction for his government's actions against our government. But that didn't seem to bother Paul, who invited Kosachev and others to visit the USA. Indeed, this sanction and other tokens of disapproval imposed on Russian officials in the past year have not seemed to chill the enduring warmth between Russian President Vladimir Putin and Trump. Paul carried a handwritten note from Trump to Putin on his trip. A recent Gallup Poll showed some 40 percent of Republicans, a plurality of the self-identified category, now regard Russia as an ally or at least as a country friendly to the United States. That is double the percentage of Republicans who expressed that view to Gallup in 2014. One need not go far to find enthusiasts at any Trump rally who say they have no problem with Russians helping elect or re-elect him — so long as he fulfills his campaign promises to Americans such as themselves. Who cares? Countries interfere with the internal business of other countries all the time. Just after he took office in 2017, Trump was asked on Fox News about Putin's reputation as a "killer." Trump shot back: "You think we're so innocent?" And the dominant image of America's posture toward the autocrat in Moscow is now the sight of the two presidents on stage in Helsinki last month for a news conference. Much of the world was shocked at their cordiality, at Trump's apparent acceptance of Putin's denials about 2016 election hacking and at Putin's open admission that he had favored Trump's election. This week, the U.S. did finally get around to issuing some new sanctions against the Russians for using a chemical agent (Novichok) to carry out an attack on foreign soil in violation of international law. The poisoning of a former Russian spy (Sergei Skripal) and his daughter in London in March had prompted widespread condemnation and sanctions from other countries. But months went by between the determination of Russian guilt in that incident and the formal response from the Trump administration this week. Trump also has grudgingly postponed a planned Washington visit by Putin, pushing it into the new year with the proviso that special counsel Robert Mueller's investigation of Russian interference in the 2016 election be finished first. But the real endpoint of that probe is far from certain. This week, in a related trial in federal court, former Trump campaign chairman Paul Manafort has been shown to have extensive entanglements with Russians. These include debts to Oleg Deripaska, a member of Putin's inner circle of associates, who has sued him and his former associate Rick Gates for $25 million. How seriously should we take any of this? Some are asking whether Manafort's exposure to Russian pressure and influence might be a reflection of Trump's own. That spurs a defensive reaction from the presidents' staunchest supporters, such as the guys in the T-shirts, who may regard it all as a kind of joke. Or perhaps it was just their way of trolling the world or letting us know how much they disliked the Democrats. And if seeing that message was also a hoot for Putin, so be it. Paul speaks for the "who cares?" wing of the party by saying Russia did nothing that other countries don't do "all the time." Like his father, the iconoclastic libertarian and frequent presidential candidate, Ron Paul, the Kentucky senator is quick to note the instances of U.S. interference in elections abroad. For those who take their cues directly from Trump, all tales of Russian influence and interference are distractions that border on being a conspiracy against the Trump regime. It has been called a "coup in slow motion" by more than one commentator on the right. Of course, many Republicans have not changed their view of Putin or his government. Arizona Republican Sen. John McCain continues to call Putin "a thug" and denounces his "vile attacks on democracy." The conventional view among congressional leaders is that Mueller's investigation of Russian interference should go forward and that Putin cannot be trusted. A phalanx of Trump officials came to the White House briefing room last week to pledge a vigorous defense against Russian efforts to hack the 2018 midterm elections – efforts they acknowledged were very much underway. Yet it is impossible to miss the shift in attitude in key parts of the conservative coalition. This was presaged by an undercurrent of admiration for Putin that had existed for years in some quarters of the conservative blogosphere. Sarah Palin, the outspoken party nominee for vice president in 2008, had this to say to Sean Hannity on Fox News in 2014: "Look, people are looking at Putin as one who wrestles bears and drills for oil. They look at our president [Obama] as one who wears mom jeans and equivocates and bloviates." Palin at the time seemed mostly interested in using Putin as a critique of Obama. That same year, a poll by the nonpartisan YouGov found only 10 percent of Republicans viewed the Soviet strongman favorably. But the implicit admiration Palin expressed for certain qualities perceived in Putin was present among some American conservatives — as it was in nationalist and populist elements of the political mix in other Western democracies — even before Trump's ascendance. But it was Trump who gave this strain of thought a massive steroid shot with his attitude toward the Russian autocrat throughout the primary and electoral season. Another YouGov.com poll late in 2016 found the percentage of Republicans viewing Putin favorably had nearly quadrupled in two years to a stunning 37%. Even more remarkable, perhaps, was the decline in those poll respondents who said they disapproved of Putin strongly. That response was chosen by an outright majority of Republicans (51%) in 2014 but by just 10% in late 2016. It must be said that a corresponding change has overtaken many Democrats in the Trump era. Many who were all in favor of the famous "reset button" policy when Hillary Clinton was secretary of state in 2009 are now suddenly wary of the Kremlin and all its works. They see nothing but evil. Part of that is experience. They have seen Putin seize Crimea and besiege parts of Eastern Ukraine. They remember the Dutch airliner that was shot down by a Russian missile in that region. Still, the spectacle of Republicans defending Russian interests while Democrats attack, represents a role reversal as striking as any in this era of irony. At bottom line, the idea of "getting along better" with Russia dates back to Mikhail Gorbachev's glasnost era and the efforts at "détente" before that. Even before the "Iron Curtain" was lifted, the idea of nuclear war had receded and the poles of the Cold War had seemed less diametrically opposed. Henry Temple, also known as Lord Palmerston, was twice the British Prime Minister in the 1800s. But he may be best remembered in our time for these words: "We have no eternal allies, and we have no perpetual enemies. Our interests are eternal and perpetual, and those interests it is our duty to follow.". These words are often quoted as a capsule of what we now call Realpolitik, an approach to foreign policy emphasizing a realistic assessment of each nation's selfish ends over any kind of idealism on the international stage. By Palmerston's dictum, any nation we have fought as an enemy may become an ally and friend — but only for the interval that history dictates. In the first half of the 1900s, the U.S. fought two wars in Europe in an alliance against Germany that included Russia. Since then, we have been resisting the Russians and busily building back Germany as the anchor of Europe's own defenses. A similar reversal has taken place in Asia, where we backed China and fought Japan in World War II, but have been close allies with Japan and antagonists of China for the last seven decades. Palmerston also said that "the law of nature is stronger than even the law of nations," adding that "the law of self-preservation" is the only law a nation needs appeal to for justification. That dictum could apply as well to leading political parties and the individuals in them. None has permanent friends, only permanent interests. And for political parties by their nature, that permanent interest is in getting and holding power. Republicans may see nothing wrong in collaborating with Putin, whatever his acts and whatever his aims, so long as it serves their own sense of grievances and policy preferences. And those who do still fear Putin's intentions are at least equally wary of the power of this president. They have seen how quickly he can hide his face and blot out the sun for an aspiring candidate or a familiar figure struggling to survive. To cross him, as has often been observed, is to invite defeat in the next party primary or isolation in the next party caucus meeting. If maintaining the current Republican hold on the White House and Congress means justifying and defending President Trump's attitude towards Putin, then for many that is the party's mission. There was a striking image from a rally President Trump held in Ohio last weekend. A reporter from cleveland.com posted a photo of two Trump supporters wearing T-shirts that read I'd rather be a Russian than a Democrat. NPR senior editor and correspondent Ron Elving has been trying to make sense of a broader trend of some on the right showing coziness with Russia even as the president and his administration seem at odds over whether to treat the country as an adversary. Hi, Ron. RON ELVING, BYLINE: Good to be with you, Ari. SHAPIRO: Republicans have traditionally been a party of hawks against Russia. And beyond this one really striking image from the rally over the weekend, there have been some more concrete examples of Republicans embracing Moscow. Tell us about them. ELVING: Yes. The Gallup organization has recently done a poll that found 40 percent of self-identified Republicans said they now consider Russia to be an ally or at least a country friendly to the United States. That's rather striking because polls done before the Trump era did not find anything like that number of Republicans who felt that way about Russia. SHAPIRO: And also among Republican leaders there have been direct overtures. Rand Paul was recently in Moscow. Tell us about this. ELVING: Senator Rand Paul, Republican from Kentucky, has been hobnobbing around Moscow the past week, meeting with a number of people described as his counterparts, actually. If anything, they seem they might be somewhat higher up in the structure of the Russian Council than he is in the Senate of the United States. But he is seen there as a representative of President Trump. And he's really been given the red carpet treatment - no pun intended - and that is something that he seems to have embraced, not too surprisingly given that his attitude towards Russian interference in the 2016 election in the United States, as described by the U.S. intelligence community, as something less than a big deal. He says, like we haven't interfered with other people's elections? Like, this isn't the kind of thing that countries do to each other all the time? So he has kind of a shoulder-shrug attitude towards that, and the Russians welcome that as well. SHAPIRO: Just a matter of where the leader of the party goes, the rest of the party will follow. As President Trump has been warm to Russia, other Republicans have done the same. ELVING: There were precursors to President Trump's new attitude towards the Russians, or new at least for the Republican Party. Sarah Palin, for example, who was the Republican vice presidential nominee in 2008, had said some nice things about Putin over the years, admiring the way he projected the strong nationalistic spirit of his country. And other Republicans did as well, even before the emergence of Donald Trump. SHAPIRO: This puts Trump's national security team in a difficult position because they are dealing with sanctions against Russia. They're dealing with Russia's attempts at election interference while much of the rest of their party is going in a different direction. ELVING: Just last week, we saw four or five people from the very top of the national security apparatus of the United States come to the White House briefing room and describe all the things they're doing to keep the Russians or anyone else from hacking the American elections this fall, the November midterm elections. These are the same people who have acknowledged that the Russians came after us in 2016 trying to hack into the system, not only into the email files of various Democrats but also into several states' actual vote tabulating, voter identification databases, things of that nature. This is what they're trying to prevent in 2018, making absolutely no bones about the fact that it's being done by the Russians. And as we heard from Vladimir Putin himself in Helsinki, they much prefer Donald Trump as president of the United States. SHAPIRO: Is there any evidence that this is reshaping foreign policy in the long term? ELVING: One thing that does seem to be changing about our foreign policy is our alliances and our alignment with countries around the world, particularly our European allies, Canada, as opposed to countries that we have been more at odds with for reasons - for reasons having to do with their undemocratic processes and for reasons having to do with their behavior, such as Putin going into Crimea, Putin supporting the regime in Syria. That kind of foreign policy seems to have been put on hold for a foreign policy that has a lot more to do with how foreign leaders relate to Donald Trump. SHAPIRO: You can read more about this at npr.org from NPR's Ron Elving. Thank you, Ron.